my lumix compact camera has a maximum self-timer of ten seconds, enough time for me to move into the position i hope i want to capture, but scarcely enough time to grab the bicycle and pedal off into the sunset while still capturing an action photograph. i did download an app for my ipod touch that would allow up to a couple of minutes, but the camera on the ipod isn't that great, and it's a devil of a job to find somewhere to set down an upright ipod. however, in the world of slow exposure times, that proposed by jonathon keats puts either of my cameras well into the shade. he is in the process of taking a photograph the result of which he will not live to see. his project, possibly underway as we speak, is attempting to capture a 1000 year exposure of the skyline seen from the roof of the arizona state university art museum, based in the city of tempe, arizona. the camera is fashioned from solid metal, fronted by a 24 karat gold plate featuring a miniscule pinhole. instead of a digital ccd or indeed, film, this 1000 year camera will store the image on oil paint. over the projected time-span, the colour in the paint will fade where the light is brightest resulting in a very, very slow positive image of the world in front of its pinhole. according to keats, the photo will show not only the skyline, but how it develops over time. "for instance, old houses torn down after a couple of centuries will show up faintly, as if they were ghosts haunting the skyscrapers that will replace them." in a display of faith and optimism, the arizona state university has said it will hold an exhibiiton when the work is completed in the spring of 3015.
the notion that imagery long since past ought to appear as faded portions on the paint strikes me as a particularly apt way of recalling past events. assuming your memory to be as pin sharp as the front of keats' camera, rides that have been undertaken recently ought to be pretty much fresh in every detail. it would be nice to think that those from further back on the personal timeline could exist in a less 'in your face' manner, allowing for a healthy degree of perspective. nostalgia has a habit of making events from the past seem far more amenable than was perhaps the case at the time. the mighty dave t has often entreated us to a verbal dissertation on how much better those lugged steel and ten-speed days were before electronic and hydraulic modernity took over (actually, that's not true, but it fits my story far better), and i remember both parents and grandparents offering similar platitudes of nostalgic joy. and so it is with yesterday's cycling jerseys, particularly those beloved of the professional peloton, decorated as they were with contemporary graphics and the names of sponsors, several of which are now confined to history themselves. perhaps it's better that we recall them as faded shadows of their former selves, embodying the spirit of the era but without underlining the anachronism of sporting defunct logos in the coffee shop. 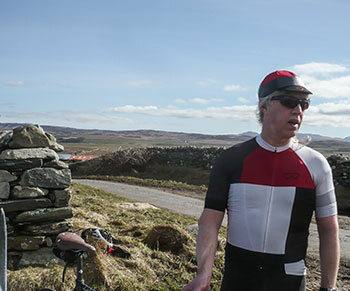 such has been and remains the philosophy behind rapha's annual trade team jersey collections. this year's release recalls the renault years of bernard hinault and laurent fignon, the la vie claire spirit of greg lemond and the british assault on the tour de france through the auspices of anc halfords. 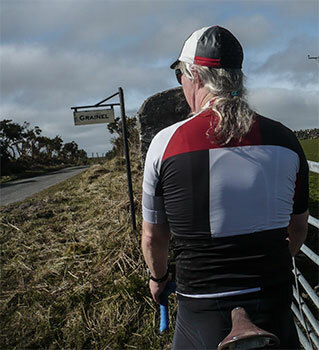 having queried the loss of sportwool as the fabric choice for all three, it was pertinently pointed out by rapha's press officer that these three formed a part of the transition from wool jerseys to the variations of polyester that frequent the peloton today. in the light of this explanation, their man-made constitution makes perfect sense. it would be naive, however, to think that the lack of embroidered sportwool might be seen as short-changing of the prospective customer. while rapha's pro-team range occupies the hi-tech, minimalist cutting edge, the 2015 trade team jerseys offer a slightly less restraining fit and a variety of panels designed to aid breathability while attacking in the mountains. 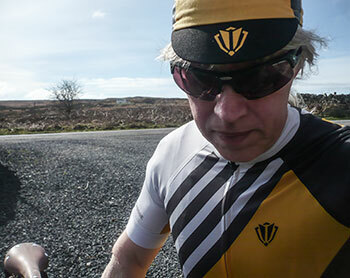 the fabric is indeed that of the pro-team kit, but to my mind, seems less aggressive for want of a better word. 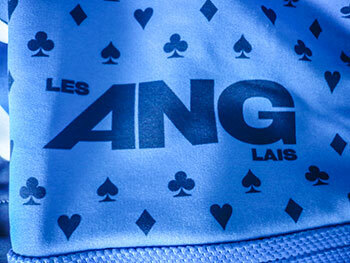 the designs are cleverly conceived, the la vie claire jersey featuring an outline motif of the oakleys sported by lemond, while the right sleeve of the anc jersey features the capital letters ang, preceded by les and the subscript lais (les anglais). art does indeed lie in the details. the fit of all three is, as usual, impeccable, with a full-length front zip and a low collar. the three capacious rear pockets are augmented by a fourth zipped version cunningly concealed inside. the faded imagery proffered by these three excellent designs can also be accessorised with matching cotton caps, the print of which seems almost rubberised in its screen printedness. with one very much the twin of the other, it would be silly not to purchase the matching set. 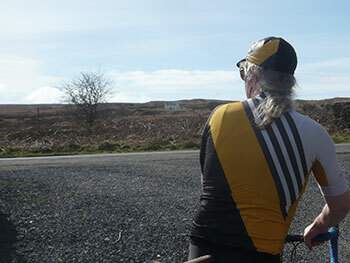 in an embodiment of the spirit of the old grey whistle test, despite my not making any fuss of wearing any of the three, i was greeted with more than just one "that's a nice jersey" from those who rarely notice my existence, let alone the clobber i'm wearing. mind you, the mighty dave t was mightily impressed by the anc halfords version. all in all, a delightful way to recall the faded, yet halcyon days of yore. 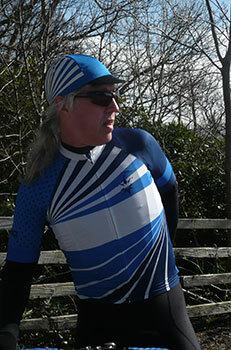 rapha's trade team jerseys retail at £90 each, available in sizes from xs to xxl. the matching cotton caps cost £25 in one-size-fits-all.